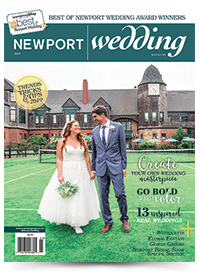 Start your day at either venue, Rosecliff or OceanCliff , and leave your car there to enjoy a complimentary short trolley ride to the next venue, provided by the Newport Wedding Trolley . It's a great way to relax and chat about the wonderful wedding professionals you just met, and compare notes on the tasty treats you just sampled and the fabulous fashion show you enjoyed! When you arrive at your second mansion venue, you'll be ready to do it all over again!